Bridal Bee's Blog on Flower Girls & Beyond: Riley in her Red Christmas Dress! Check out this adorable photo Corissa Haas shared with us! This is the lovely Riley wearing a fantastic red satin dress and our pearl headband! Doesn’t she look amazing? Thank you Corissa for sharing this photo with us! Corissa and Riley worked together to create a look that is completely personalized! If you didn’t know, both the dress and the headband come in multiple colors which is PERFECT for customization! Red is such a vibrant color that is never worn enough! We do love our precious pinks on a darling little lady but red is just so unexpected! Riley pulls off the red dress like a classic little lady but at the same time it’s just so adorable how the red brings out the colors of her blushing cheeks! Her soft and wavy hair balances the volume and elegance of this pick-up dress. If you’ve never tried outfitting your baby or girl in red, you should definitely give it a try! Red is just as feminine as pink, but with a little more of an outgoing personality and flair! A red dress will bring class and excitement to your next special event! Want to know what Riley is wearing? Here are the juicy details! Riley is wearing our Red Satin Pick-up Flower Girl Dress, Item Id: KK8013G-RED. For a look that is as classy as it is simple, this is a wonderful choice! Unique to most of the dresses we have in stock, this particular style has beautiful princess seams that grace the bodice, extending from the armhole and sloping gently into the waistline. The princess seams are very flattering and not seen often in a lot of dresses! The full skirt features pick-ups and gathers that create lovely and elegant pinches in the satin fabric. To finish the look, a satin sash accents the waist, tying into a large bow at the back! If red isn’t your first choice, this dress comes in a whopping SEVEN colors not including the TWELVE different sash colors to choose from! Dressing for a holiday or a themed event has never been so easy! Riley is also wearing our Pearl Headband for Flower Girls, Item Id: PEARL-HB. Diamonds shouldn’t have to be the only best friend to a girl…pearls should count too! This exquisite pearl-beaded headband will bring ultimate sophistication and vintage romance to any outfit! If you’re looking for additional personalization, try adding on one of 10 ribbon color options to be tied onto the headband as a dainty bow! Who knew a charming headband could be so affordable and easy! 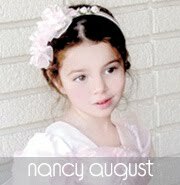 If you would like your little angel to be featured on our blog, send your photos to: info@NancyAugust.com!